Opening Lines: "Every fairy tale starts the same: Once upon a time. Maybe that's why we love them so much." "Delia's new house isn't just a house. Long ago, it was the Piven Institute for the Care and Correction of Troubled Females—an insane asylum nicknamed "Hysteria Hall." However, many of hte inmates were not insane, just defiant and strong willed. Kind of like Delia herself. "But the house still wants to keep 'troubled' girls locked away. So, in the most horrifying way, Delia gets trapped. "And that's when she learns that the house is also haunted. "Ghost girls wander the halls in their old-fashioned nightgowns. A handsome ghost boy named Theo roams the grounds. Delia finds that all the spirits are unsettled and full of dark secrets. The house, as well, harbors shocking truths within its walls—truths that only Delia can uncover, and that may set her free. "But she'll need to act quickly, before the house's power overtakes everything she loves." Lately, I have been scouring Pinterest for the latest and best horror novel. For some reason, there has been a bug up my rear end as it pertains to horror and the quest to find the best. Several of the pins I found suggested this book was up there. 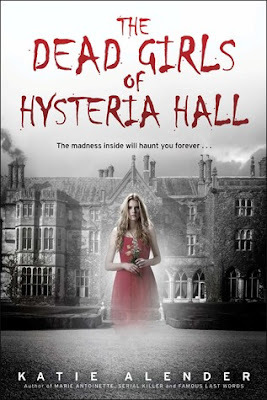 The mention of a haunted asylum had me quivering with excitement! Sadly, this book was another in my growing list of duds. To be honest, I do not want to spend much time discussing this book. It was not horror nor was any aspect scary. There were many elements that could have been extended or explained, which would have made it an excellent read. Unfortunately, for whatever reason, the author chose not to follow them. Following the cliched format of a haunted asylum story, the book ended up a predictable snooze-fest. The characters were one-dimensional and showed zero originality. Once finishing the book, I felt unfulfilled due to the unanswered questions. If you're interested in a tired, kiss-your-brain-good-bye read, this is for you. It doesn't require too much thought and can easily be read in a few sittings. It provided some nice respite from the endless textbooks, so it ended up squeaking by with two stars.